While it’s lovely to see so many diseases gaining awareness in the movies and television lately, there’s a downside to all this attention for the people who actually have serious illnesses. Fans of these movies and TV shows appear to be glamorizing this lifestyle, yearning for an existence they truly know nothing about. You’ll see this unfortunate longing on social media sites such as Instagram, where users will steal photos of real patients and claim them as their own for attention, for likes or to gain followers. I’ve even come across individuals who will “dress up” with fake medical devices to look like their favorite characters at the premiere of popular movies. You can see why this media depiction can lead to tremendous misconceptions for the general public regarding illnesses and cause concern for those of us who actually deal with diseases day in and day out. More than once I’ve had someone ask me if my medical devices were real. This question always shocks me. Why would anyone fake an illness? Why would anyone tote a heavy oxygen tank without actually needing one? Why would anyone want this life we are forced to endure? All of this truly hit home for me on a particular sunny day in June when I decided to head to the local water front. As I walked on the crowded pier with my oxygen tank, feeding tube equipment and short brown hair, a young woman pointed and yelled in my direction, “Look! 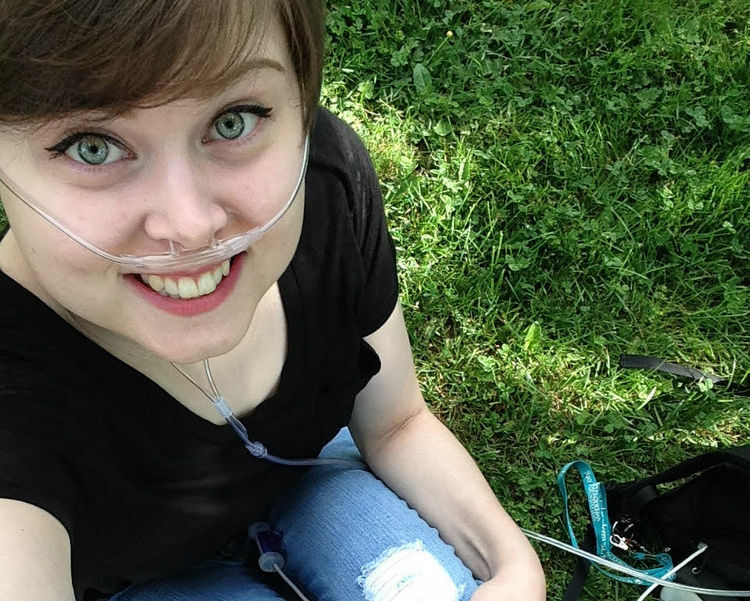 It’s Hazel Grace!” She was referring to Hazel Grace Lancaster, a fictional character from the popular book/movie “The Fault in Our Stars” who has a serious illness requiring supplemental oxygen. (Hazel is loosely based on an actual patient named Esther Earl, a personal friend of the author John Green, according to Hollywood Life.) While this young woman didn’t mean any ill intent, it still stung quite awfully. I’m not an actress, and I’m not a character in a movie; I’m an actual serious illness patient just trying to live her life. My medical issues don’t halt when a director yells cut, and I certainly don’t return home a healthy individual free of medical devices when the work day is through. I must suffer each day as my body slowly deteriorates from a disease I never asked for. Please be respectful when you see someone suffering an illness in public, especially if they have obvious medical apparatuses. We don’t tote these heavy accessories for attention but to sustain our lives. We want nothing more than to fade into the background and enjoy the sunny day with our families just like everyone else on that pier. Read more about Chanel White’s journey on A Day in the Life of a Tube Fed Wife. The Mighty is asking the following: Describe a moment you were met with extreme negativity or adversity related to your disability and/or disease (or a loved one’s) and why you were proud of your response — or how you wish you could’ve responded. If you’d like to participate, please send a blog post to [email protected] Please include a photo for the piece, a photo of yourself and 1-2 sentence bio. Check out our “Share Your Story” page for more about our submission guidelines.